I love when unpredictable things happen with the site. I had planned four days of interviews for this week, and we got them. 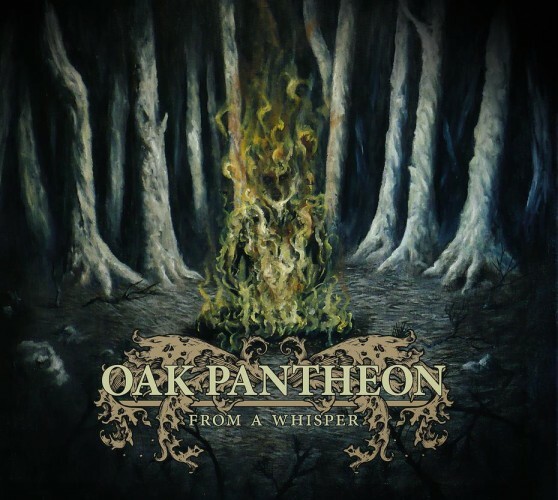 All along, I had Oak Pantheon scheduled for today so we could discuss their stunning new album “From a Whisper,” my favorite of the four releases we covered this week, and we highlighted some incredibly stellar records. For each band, one member graciously devoted time to the questions and gave us exploratory answers. I could not be more grateful. But Oak Pantheon went a level higher: All three guys responsible for the band’s sound took time to answer our questions. Sami Sati, Tanner Swenson, and their sound engineer Sean Golyer all went into great detail, and I can’t thank them enough for going above and beyond. In fact, they gave us so much detail that we’re going to break this into two parts. The first section you’re reading now, and the second will appear Tuesday. The music is emotional and captivating, reminding a great deal of Agalloch, and their playing is already at storied veteran level for dudes so young. Be sure to check out “From a Whisper” (Broken Limbs), a record that has the Meat Mead Metal stamp of approval. Meat Mead Metal: The band is releasing its second effort “From a Whisper.” It’s quite an emotional, ambitious album. Are these songs as personal as they sound? Please explain. Tanner Swenson: We’re really proud of this album because we accomplished our goal of making good music that stands on its own with powerful lyrics that can be interpreted and felt by our listeners. One of our main focuses was making sure that no lyrics became throwaway filler. I have always argued that lyrics don’t mean as much as the music, but I’ve come to realize over time that every person is affected differently by music. Some people really pay attention to lyrics, while others completely ignore them. I feel like we were able to write an album with the best of both worlds, and it is a very powerful thing. The songs are very personal in that they deal with our own human struggles with faith, mortality, death, fear, and what have you. We try not to take a concrete stance on either side of an issue because there really is no “right” answer to anything; it’s all how the issue is perceived by the individual. Sami Sati: We definitely had a huge emphasis on lyrics this time around, as Tanner said. We still cared about writing good lyrics with “The Void,” but I was genuinely surprised at how many people said they were moved by the lyrics. Even the vocal recording process was much more focused this time around. We spent much more time trying to make each word sound perfect as opposed to just screaming something over the music and calling it a day. And I’m honestly glad to hear that you think the songs sound very personal, because that’s become an increasingly important thing to me. I’ve always thought that music is a great place to express ideas that you can’t otherwise bring up in normal conversation. MMM: You’re teaming up with Broken Limbs for the release of the album. What was it about that label that made you feel most comfortable? Sean Golyer: The label owners and their business philosophy. Bari came to us as a fan first who wanted to put us on a compilation she was putting together. We stayed in contact over a period of time and soon enough she had started a brand new label with some colleagues. We really liked their “hands-off” approach to each band’s music and saw them make some great underground releases. They’re very open about their ideas for our releases and always keep us informed. It makes for a very fluid and open relationship with a label that isn’t focused on milking you for everything you have. They genuinely care about each and every project they take on, and we just felt safe with them. MMM: While the band’s music certainly is steeped in black metal, there also is a folk element to what you do. Are you fans of that style of music? Or did that sound come in from some other inspiration? TS: That element may have come from an influence that was very relevant to us at the time of writing, but it’s hard to say. I will go through phases with bands and styles, and my writing during those times most likely will reflect that to an extent. In terms of the folk influence specifically, I think listening to how well Agalloch integrate that style into their music inspires me to try similar things, but usually with a heavier sound. SG: Black metal and folk are just a couple of a very wide range of influences we draw from. We’re fans of a lot of different music, and I think that tends to manifest itself into the songwriting and production process. It keeps our listeners on their toes and prevents us from stagnating and writing the same kinds of songs over and over. That’s pretty boring to us. SS: I wasn’t always a big fan of folk music, and even though “The Void” had folk influences, it wasn’t until after we released that EP that I started listening to folk music on a regular basis. A big part of the folk sound also comes from the use of acoustic and classical guitars. For me, nearly every song I write is done so on my acoustic guitar. I don’t even try and see what the parts in a song will sound like on an electric guitar until I’ve started recording a demo for it. MMM: There also is quite a woodsy feel to what you do. Do you draw inspiration from your surroundings in Minnesota, or does that come from something else? TS: One of the most difficult things for me to do with our music is listen objectively and pick out where different sounds and influences shine through. I would say a lot of the “woodsy” feeling passages come from me doodling on my classical guitar or Sami playing around on his acoustic. I also try to create an image in the listener’s mind with my lyrics, which often means I will use nature themes. SS: It might just be a subconscious thing at this point, but I’ve never really made the connection that Minnesota has influenced me to write “woodsy” music. If anything, I’m surprised that a folk-influenced metal project started at all in Minnesota considering the current music scene here. I will say that most of my heavy writing occurs during the autumn and winter months, however. Something about the transition between those two seasons always inspires me to write music. MMM: Yet another element is the power and catchiness to the songs. They may not be traditional, but there are some hooks. Is that an important element for Oak Pantheon? Do you consciously try to add that sticky element into what you do? SG: Extremely important. If a song doesn’t have “that moment” or a wow factor to it that sticks in your head, it typically doesn’t make the cut. We have a strict “no filler” philosophy when it comes to producing our material. It’s a very conscious decision by all of us. TS: I agree with Sean that a catchy element is extremely important in a song, but I’m not sure if I’m always aware that I’m writing something catchy until after it has been demoed and repeated on my iPod a bunch. Even though we are heavily influenced by black metal music, I don’t really listen to much of it at all. The “catchiness” factor is what makes me want to go back and listen to a song over and over, like an addiction. Pop songs are admittedly catchy, but most aren’t good songs. That doesn’t mean a good song can’t be catchy though, which I feel is a fairly common belief in the extreme metal scene. SG: Yeah, that’s a fair point. We never start writing a song thinking “OK, what’s going to be the hook on this one?” It just sort of happens as we write, because that’s what we want to hear as listeners. It only becomes a conscious decision after the fact when we’re deciding what to keep and what to trash. SS: It’s not entirely intentional, but I do think it’s important. For me, I can like a song that isn’t catchy and listen to it a million times. The ones that stick with me, however, are the ones that have something that gets stuck in your head. I don’t think it necessarily has to be a “hook” or a catchy chorus either. I think a quick shift from mellow to intense music is just as memorable as a good chorus. And I think that’s one of the core goals we have as writers: to make our music as memorable as possible. MMM: For listeners familiar with “The Void,” how would you say “From a Whisper” differs from that album? SS: We don’t want to release another album that sounds like “The Void.” I can understand completely if certain people like “The Void” more than “From a Whisper.” The biggest thing I think people will notice right away is the change in vocal styles. Tanner does clean vocals on a few of the tracks, and I’ve changed how I do my harsh vocals on this album. And while “The Void” was undeniably a black metal album, I don’t think listeners will instantly label “From a Whisper” as black metal. Black metal is perhaps the most important genre of music to me, but I don’t want to limit Oak Pantheon to being just black metal. If we want to write a folk song, we’ll do it. If we want to write a post-rock song, then we’ll do that as well. Even on “From a Whisper,” there are two songs in particular that I wouldn’t even label as metal. TS: “From a Whisper” shows where we are in our musical evolution. Even since we finished the material for this album, we have been writing new stuff that we consider to be even better. Some people will like “The Void” better, but “From a Whisper” offers much more diversity and replay value. We hope to continue making releases that are undeniably Oak Pantheon but are also evolutions of our previous work that have a distinct sound from one another. The most exciting bands are the ones that continue to surprise and get better, and we have a lot of getting better still to do. SG: Sonically the new album just plain sounds better. The guitars are thicker, the drums are bigger, the vocals cut through the mix better without overwhelming the instruments, and the melodies truly soar above the mix. We used essentially the same recording process as we did with “The Void,” but we were more familiar with our tools, had more experienced ears, and had a better mastering engineer to handle the final touches. Justin Weis, who has also done work for bands such as Agalloch, Ludicra, and Cormorant, did a great job enhancing our mixes, bouncing down to tape, and just making the album sound that much bigger and better. Check back Tuesday for Pat 2.